Getting Cozy: Isn’t It Punny? Insurance Map of New Orleans, Louisiana, Volume One, Sanborn Map and Publishing Limited Co., 117 Broadway, New York, April 1876. New Orleans is well known for its interesting (and pothole riddled) streets, but perhaps one of the most unique is Tchoupitoulas (chop-ah-too-luhs). Distinct not only for its name but also as one of the longest streets in the city at 5.5 miles, Tchoupitoulas runs from the Central Business and Warehouse Districts to Audubon Park. Early documents include almost as many spellings for Tchoupitoulas as there are suggestions about its origin. Some scholars contend that it is a combination of Choctaw words Chapitoulas: hatcha ("river"), pit ("at"), and itoula ("reside") or "those who reside at the river." Another theory is that the word is derived from the Choctaw-French name for mudfish—choupique—and referred to a local tribe and meant "mudfish people" or "fish hole road." A row of masonry buildings, possibly warehouses. 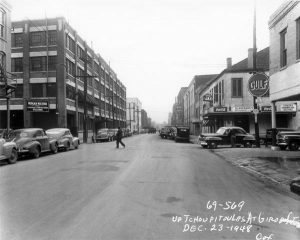 [ 600 riverside block of Tchoupitoulas St., New Orleans?]. The Historic New Orleans Collection. Painting in Louisiana from The Historic New Orleans Collection. ca. 1843. The story goes that a Frenchman approached some Native Americans fishing and asked if there were any fish in the bayou. The men responded "Choupiques tous lá," or the"mudfish are all there." Thus the people and the bayou were named. John Chase believes that the origin of the name is actually Chapitoulas and refers to the people who lived by the river, and the variations in spelling are the result of a Choctaw or Mobilian word being repeated by the French and Spanish. The different spellings reflected the different speech patters and dialects of individual speakers. View up Tchoupitoulas at Girod Street in the Warehouse District. There is a welding shop, Gulf service station and a restaurant on the corners. Between 1979 and 1983 from Safety film negative created Dec. 23, 1948. 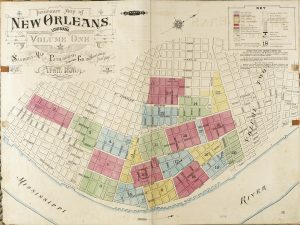 The Historic New Orleans Collection (http://www.hnoc.org) Digital Collection, Charles L. Franck and Franck-Bertacci Collection. For example, the minutes of the Illustrious Cabildoopens a new window on October 30, 1789, include mentions of both "Choupitoula" and "Choucpictoula" in the same handwriting.